GKD Sports Cars is a small volume car manufacturer based in Boughton Monchelsea, near Maidstone, Kent, with workshops at Lenham. GKD Sports Cars produce two models, the GKD Evolution and the GKD Legend. GKD Sports Cars was founded in 2006 when company MD Peter Lathrope purchased the Ginetta G27 project. The car was then modified to improve aerodynamics and styling. 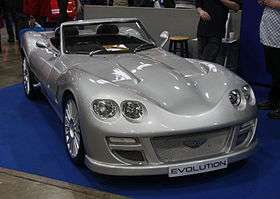 The company won car of the year 2006 from Which Kit Car magazine with the Evolution. This included winning 5 out of 7 categories in the competition. In 2008 the company launched two new models, with the Evolution being upgraded to use BMW 3 Series (E36/E46) running gear and then launching a new model, the GKD Legend at the Exeter Kit Car Show in November. This received a very warm welcome with the press and public, as both cars are the first mainstream kit cars to use BMW 3 Series E36/E46 running gear. As well as supplying and building the Evolution and the Legend, GKD also supplies Racelogic traction control, alloy wheels and tuning parts. GKD Sports Cars also completes part build projects, put cars in for the IVA test and tune and complete engine conversions for BMW road cars. Because of the Evolution's background, GKD launched the first production hard top for the Ginetta G27. GKD also supplies upgrades and parts for the Ginetta G27. This article is issued from Wikipedia - version of the 5/7/2015. The text is available under the Creative Commons Attribution/Share Alike but additional terms may apply for the media files.